Azalea ‘Fashion’ is a Glenn Dale hybrid. Glenn Dale hybrids are evergreen, semi-dwarf, and have bigger and more colorful flowers than Azalea in the Southern Indian group. 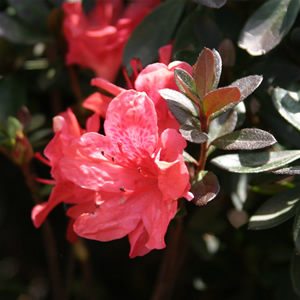 The Fashion Azalea has a salmon-pink colored flower that is 2 inches in diameter. It is a medium sized shrub that reaches up to 6 feet in height with an equal spread. Like all Azaleas, Fashion Azalea does best on an acidic soil.